We live in a time of 80's nostalgia. Nostalgia for 80's music, movies, films, TV shows, toys and yes, video games. The 80's were the Golden Age of the Arcade and the arcade was the foundation of video game culture as we know it. 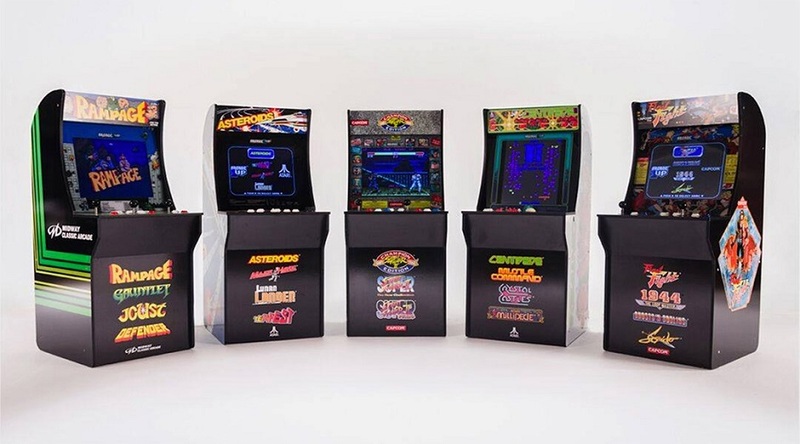 Recently, Arcade1up has rolled out with mini versions of classic machines to capitalize on this phenomenon. Retailing at an MSRP of $299 , the draw for consumers is having your own personal arcade machine in the comfort of your own home. Being downsized versions of large missions that run on emulation, there's some good and there's some bad here. I've been fortunate enough to try every single machine from the 2018 product line at conventions and events. As GameTyrant's resident Arcade Expert, it's my sworn duty to report the ins, outs, triumphs and follies of these cabinets to y'all. This rundown isn't going to be about how to assemble an Arcade1up machine, you'll have to look elsewhere for that. Rather, this will be an analysis of build quality and how these reproductions compare to the originals. The Asteroids Cabinet features a dial controller and 5 action buttons. It comes loaded with Asteroids, Tempest, Lunar Lander and Major Havoc. I enjoyed this one quite a bit. The awesome vector graphics of Tempest and Asteroids can’t be properly recreated, but everything handles as it should. The Centipede Cabinet comes with Centipede, Millipede, Crystal Castles and Missile Command: 4 classic games by Atari that feature trackball controls. Out of the gate, this one isn't too hot. The trackball controls feel slightly off. It's tolerable for me with Centipede and Millipede. It doesn't feel arcade perfect, but it's at least playable. Crystal Castles, on the other hand feels VERY WRONG. I'm seeing this machine discounted down as low as $79.99 at nearby Wal-Marts and Targets. I would say that if you've always wanted to own your own Centipede/Millipede machine, go for it, but get ready to install your own trackball or have a friend ready to help you. The Galaga Cabinet comes with Galaxian and Galaga; The Pac-Man Cabinet comes with Pac-Man and Pac-Man Plus. These are both great and feel darn close to the original. No complaints! The Midway Arcade Classics machine has 3 joysticks, 6 action buttons in total (two per player) and two start buttons. It comes with Rampage, Defender, Joust and Gauntlet, with Rampage being the headliner for the cabinet. The facade perfectly recreates the beautifully hideous artwork of the original machine. Funnily enough... I think this one is best suited for playing Joust and posssssibly Defender. The sticks feel great. The buttons feel great. However, it's too crowded having three people huddled over this tiny machine to play Rampage. I've played it with two other people, and I have a right to complain about it. There's hardly any personal space to be had with everyone's hands so close together. 2 player is ALMOST tolerable but limiting Rampage to two players feels like you're stripping the experience down. Gauntlet is the most compromised game in this package. First of all, there's slowdown... in a game that features SWARMS and HORDE of enemies. The ROM also appears to be a modified version that limits cooperative play down to 2 players. The allure of Gauntlet has always been to go on a dungeon crawling adventure with up to 4 people. And that's not here. Lame. But most damning of all, some folks who have played the early production models of this unit have reported that sometimes Gauntlet will crash or freeze after a certain point. That's appalling and unacceptably bad. Because Joust only required a stick and a single action button, it works great here. No complaints. Defender's emulation feels damn near perfect. Defender was a complex machine for its time, so the button layout isn't an exact recreation of the old Williams machine, but it's at least functional. Midway Arcade Classics is a mix of good and terrible. Don't buy this one if you're looking to play Gauntlet. If you're meaning to play Rampage, I would not recommend doing a 3 player session. Honestly, if you would suggest tracking down a copy of Midway Arcade Treasures 1 on original Xbox or Gamecube or Midway Arcade Origins on PS3/ Xbox 360 and playing them with fight sticks instead. The Street Fighter Cabinet has two sticks, two sets of 6 action buttons (3 punches, 3 kicks per player) and comes loaded with Street Fighter II Championship Edition, Super Street Fighter II :The New Challengers, Super Street Fighter II Turbo with the overlay being a reproduction of the one Street Fighter II: The New Challengers (they even kept that infamous typo with Balrog!). Sorry to say , even though the overlay looks nice, I think it’s the flimsiest out of all of the Arcade1up 2018 cabinets. I am seeing these one fade out and peel off with no effort. Very mixed feelings about this one. Of all the Arcade1up machines, the video display for this one looks the worst to me. These games were not meant to be shown on an HD screen. None of these games for the Arcade1up series were, but especially with the SFII cabinet, I am missing those CRT scanlines. While the button and stick layout isn’t as cramped as the Rampage/Midway Arcade Classics cabinet, it’s still a little bit too close for my liking. The buttons themselves feel great. The sticks, not so much. I would recommend replacing them and changing the gates. They come with square gets by default, and that’s very odd to me (I prefer to play Street Fighter with an octagon gate), but even worse these sticks are not very durable. I’m seeing novice players ruin them with hardly any effort. I can only imagine in horror how a more experienced player could wreck these things. Super Street Fighter II Turbo’s sound output is in mono, even though it’s supposed to be in stereo. I also hate to get editorial here, but why do they have Championship Edition instead of Street Fighter II Turbo (arguably the best version of non-Super Street Fighter II)? Or better yet, I think they could of had Final Fight or 1941 here or some other CPS-1 or CPS-2 Capcom game instead of 3 very similar variations of the same game? So overall, there's some good here and quite a bit of bad. These things are about 4 feet tall, so I think they're perfect for kids, shorter people or folks who are getting their feet wet with the arcade experience in general but the 2018 product line requires a bit of tinkering and outside help in order to truly shine. Buyer beware! If you're interested in getting one of these cabinets, my advice would be to not pay full price. Out of the box, the Asteroids and Namco machines get my highest recommendations of the lot. PREY Joins Xbox Game Pass Tomorrow!